Ambassador of the Republic of Serbia in USA Đerđ Matkovic visited Chicago on 14 and 15 May 2015 and on that occasion had several meetings with representatives of the Serbian community. 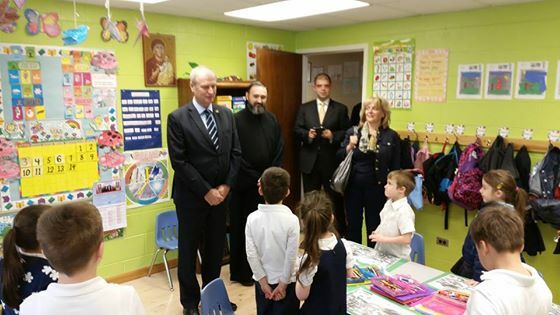 Ambassador Matkovic visited the Academy of "Sveti Sava" and became familiar with the work of the only accredited school in Chicago which has classes in Serbian language. Also, Ambassador Matkovic visited the Holy Resurrection Orthodox Cathedral, and Serbian-American Museum St. Sava. During the visit special attention was given to the possibilities for improvement of economic ties between the Diaspora and the motherland. Within this context, Ambassador Matkovic visited company PMI Cartoning in Elk Grove Village, which has shown interest to invest in Serbia. In addition, in collaboration with the Serbian-American Chamber of Commerce, Consulate General has organized the meeting between the ambassador and business people and representatives of the Diaspora with the theme "The importance of the Diaspora in the economic cooperation with Serbia - Possibilities and Challenges". 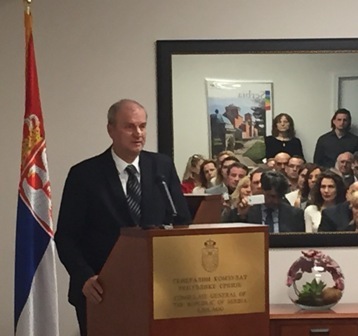 Ambassador Matkovic conveyed the readiness of the Embassy and the Consulates General of Serbia in the United States in assisting all members of the Diaspora who have plans to invest in Serbia or do business with Serbian companies. During his stay in Chicago, Ambassador Matkovic had meetings with the Deputy Governor of the State of Illinois Evelyn Sanguinetti and Deputy Mayor Steve Koch. In their talks they exchanged opinions on further cooperation between Serbia and Illinois, and on further cooperation between Sister Cities Belgrade and Chicago.